Henri Vieuxtemps is one of those Franco-Belgian composers of the mid-late Romantic period whose music leaves me with warm and favourable feelings without quite remembering why. Adolphe Biarent and Ernest Chausson also spring to mind. 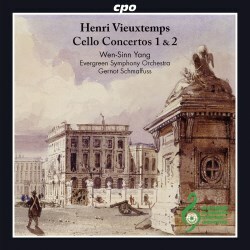 Vieuxtemps was a violin virtuoso, and while his performing and composing activities centred on that instrument, he also wrote the two cello concertos recorded here, and other assorted works. According to the New Grove, Vieuxtemps championed the “grand French” concerto by enriching the solo part, and setting it in a full symphonic framework. His endeavours were, however, “at times ... too theatrical, his passion too declamatory, his melodies too sugary”, and at best “he has nobility, charm and elegance”. Perhaps the appeal of his works, though, and why I have found them attractive without permanent attachment, is that he eschewed virtuosity for its own sake, adopting more classical, well-rounded models of composition. And so it is with these two concertos. They provide a satisfying musical meal, elegantly and tautly constructed, euphonious, and with sufficient cut-and-thrust between soloist and orchestra to keep things interesting. Both concertos are thematically strong, and while they are unlikely to send you away whistling new-found melodies, or rejoicing in original or exotic harmonies, there is sufficient stimulation to entice you back again. The liner notes argue for some superiority of the second concerto, but I found the first a more rewarding experience, feeling perhaps that in the later work either the talents of the composer or, in this case, the capabilities of the performers were being a little overstretched. Certainly in the second concerto, there is more exposed writing for both the soloist and the orchestral principals. Wen-Sinn Yang produces lovely tone throughout, and is nicely balanced against the orchestra without undue prominence. On occasion, though, his fast passagework seems not as effortless as listening comfort would dictate. The Taiwan-based Evergreen Symphony Orchestra provide competent support to Yang, if at times their intonation and ensemble indicate that venturing into more mainstream repertoire would sharpen one’s critical scrutiny. Possibly to everyone’s benefit, the recording venue has a warm, slightly tubby, and flattering acoustic. Even so, more galvanising and energetic direction might have better advanced the Vieuxtemps cause. The unaccompanied Hommage à Paganini makeweight, originally composed for viola, has a Bachian aura, and while it makes for a rather austere conclusion to the programme, it also provides an appropriate vehicle for Wen-Sinn Yang, possibly best known for his traversal of the Bach solo cello suites (review), to assert his musicianship and authority in this genre. I’ve not heard the competing Hyperion CD with Alban Gerhardt and the Royal Flemish Philharmonic Orchestra under Josep Caballé (review ~ review), which has more substantial fillers, and seems to draw a more favourable response for the second concerto. But even perhaps if the current CPO disc is not the best representation of these rarely recorded Vieuxtemps works, it will still draw you back to enjoy again.